A river flows and drops down as two waterfalls side to side, one flows down and continues and the other waterfall becomes a geological mystery, it disappears forever. This is the mysterious Devil’s Kettle Falls. Geologists and scientists are still trying to solve this mystery. The Brule River flows through the Judge C. R. Magney State Park in Minnesota near the U.S.- Canada border. The Brule River drops 800 feet in only an eight mile span generating several scenic waterfalls before entering the Lake Superior. A mile and a half before the river falls down there is a thick knuckle of rhyolite, a volcanic rock that divides the river in two. The eastern part of the divided river flows and falls 50 feet down as a normal waterfall and joins the Lake Superior. The western part of the Brule River rolls around 10 feet down into a pothole known as Devil’s Kettle, in the rock and disappears. The Potholes or Kettles are generally formed around waterfalls. The force of the water falling from a waterfall with the sand and pebbles it carries along can form a hole in the rocks. Eventually a kettle or a pot like hole forms in the rock. The water falling in the potholes rolls around in the hole and flows out from one side, from wherever it finds a gap. But in the case of the Devil’s Kettle, the water flows down the kettle and disappears. Researchers are sure that the water must be joining the rest of the river over a period of time. Many attempts have been made to trace this part of the river but all failed. Bright-colored dyes were poured in the Devil’s Kettle but no trace of colored water was found coming out from anywhere. Ping pong balls and some marked objects were dropped in the water but these objects were never found. Researchers and geologists have given a few explanations for where the water must have gone. One possibility is that the water falls down to join a massive underground river while drifting through a series of caves. The geology of the region is however not supportive for formation of caves or underground rivers. Caves usually form in areas where there is limestone, a soft rock which gets easily dissolved by water creating a path for more water to flow. The rock found under the falls is rhyolite, a hard and igneous volcanic rock similar to granite on the surface and a layer of basalt another hard material deep below. The nearest limestone to the falls is hundreds of miles away in southern Minnesota. The existence of underground caves or rivers is therefore not possible. Another explanation suggested for the mysterious falls is a Lava Tube. It was suggested that the water from the Devil’s kettle drains into a existing lava tube. Heated lava flows down from a volcano. The lava on top hardens when exposed to cool air before the lava below. This hardened lava forms a long tube like structure. The rock below the falls is rhyolite which is a volcanic rock and can never form lava tube. Lava tubes can form in basalt which is present deep below the rhyolite below the falls. But no lava tubes were ever found in any of the hundreds of exposed basalt beds in the area surrounding the falls. One more explanation given was existence of a fault line. Fault lines are cracks in the rocks. Hard rocks like rhyolite and basalt can sometimes be crushed by tectonic actions like earthquakes and water can flow along them. But the area of waterfall shows no existence of fault lines. Even if there was a fault line half of the Brule River could never pass through it. Also over a period of time the pebbles and sand falling with the waterfall would have clogged the cracks. So where does half of the Brule River goes is still not known. 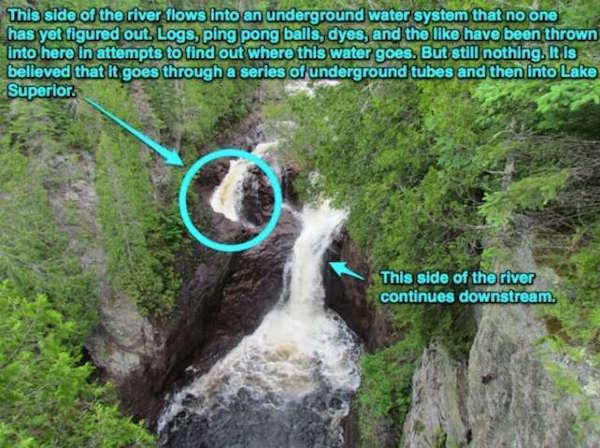 The Devil’s Kettle Falls is still a mystery.